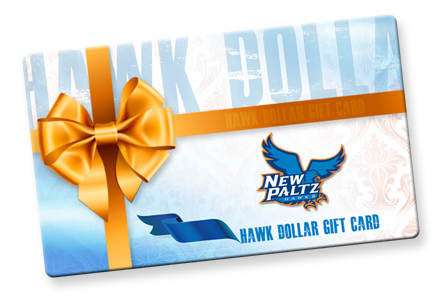 Hawk Dollars are funds deposited to your ID card that can be used for anything from books at the Campus Bookstore to the vending machines around campus. You can also use your Hawk Dollars in dining service locations as well and soon, Hawk Dollars will be available at several local businesses. Purchase for you family or friends at the Campus Card Services Office. How do I set up my Hawk Dollars Account? First visit the Campus Card Services office (SUB 64) to sign up or register your email with mycasaccount. The minimum to open a Hawk Dollar account is $25 dollars. From there you will be able to make deposits and monitor your spending in both Hawk Dollars and Dining Dollars online via my.CASaccount.com. Money added through my.CASaccount are ineligible for bonuses. Deposits to your account from friends or family can be made via phone or online. For more information, please call 845-257-3034. In addition, all dining service locations on campus accept Hawk Dollars. Your Hawk Dollars account is separate from the meal plan, and since Hawk Dollar sales are subject to the 8% NYS sales tax, any unused money (greater than $5) can be refunded to you at the end of the semester at your request.